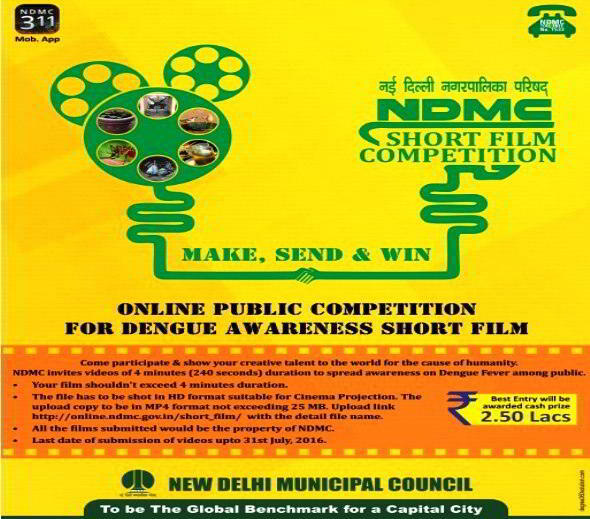 NDMC Dengue Short film contest 2016 on Dengue is organized by New Delhi Municipal Council (NDMC). With rapidly increasing cases of dengue in the Capital, the number of reported cases has reached to 62 by July 2016. NDMC has organised the contest with the aim of spreading awareness among the people about the Vector-borne Diseases spread by the mosquitoes. The video will be showcased at the NDMC Schools, Multiplexes, and Public Places. To participate in the contest, the participants have to create a short film of four minutes on the causes of vector-borne diseases. A cCash prize of Rs 2.5 Lakh will be given to the winner. The last date for the submission of the video is July 31, 2016. Videos must not exceed 4 Minutes or 240 Seconds. Videos must be HD with size less than 25 MB. Cash Prize of Rs 2,50,000 will be awarded to the winner. Candidates have to upload their video on the given link by simply registering themselves on the NDMC Portal.Candidates have to submit their videos online only. Videos submitted must be less than 25 MB. Videos of the candidates must not exceed 4 minutes or 240 seconds. The last date of submission of the videos is July 31, 2016. All the films will be the property of NDMC. All the films will be showcased by the selection committee assigned by NDMC and the winner among all the selected videos will be awarded with the prize money.